Long ago I bought a mouse with these weights. Tried them (for gaming), read some guides on how to use them, and eventually came to the conclusion they do nothing more than making the mouse harder to move around. Maybe I just don't know how to use them properly. What is the purpose of them and how do you use them correctly? Added: I still don't think we found a complete and clear enough explanation. Hence the bounty. This feature is mostly aimed at gamers and gives better control over the mouse. It's also a matter of personal preference. With a heavier mouse one has to exert more force to move it, so that slight movements that aren't meant to be relayed to the mouse through the hand get negated. If one has a very slick mouse-pad, which is a feature gamers like, less weight would make it gather less momentum, and vice verso. The idea behind using extra weight is to avoid overshooting the target. With a lighter mouse the initial reaction may be faster but with less friction desired one may need to backtrack a little to correct the aim, thereby negating the speed gained from the lighter weight. Some games may require exact motions, so a heavier mouse helps. Some games require quick motions, so a lighter mouse helps. Depending on the physical attributes of the user, some people have larger and stronger hands. Adjusting the mouse's weight is one way of making it comfortable to use. Psychologically, some people also feel that a heavier mouse is better class, and a lighter one feels cheap. Some gaming mouses can be loaded with multiple weights, so are sold with multiple and different weights. By combining the right weights, one can arrive at the exact weight he feels comfortable with in his work or his game. The Logitech G5 has an advanced weight tuning system to fine tune the inertia of the mouse, or even throw it off balance. 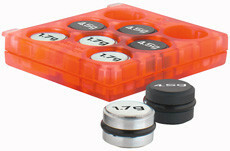 The system is comprised of two parts, a transparent orange cartridge, and a tin case for 16 circular weights - half of them are 4.5g, the other half 1.7g. 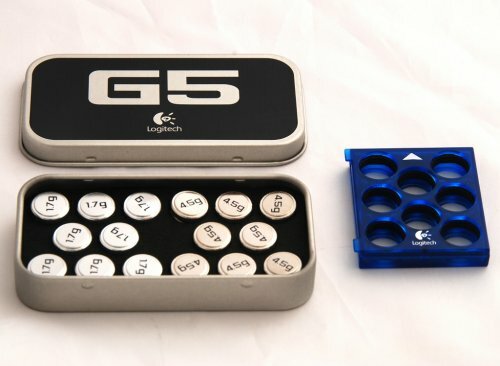 Up to eight weights snap into the cartridge's staggered array to give the G5 up to an additional 36 grams of weight. Gamers can now imitate the weight of AA batteries in a corded mouse, go as light as possible without even using the cartridge, or go somewhere in between. The G5 36 gram adjustable weight cartridge gives you hundreds of variations on balance and heft - including one that's perfect for your unique gaming style. Part of the fun of owning this mouse has been experimenting with different total weights and weight "balances" - I finally settled on a featherweight setup with 4.5g weights at the top corners so it "digs" just a little when I push on the mouse, and I might change it again. There's no wrong way to load your mouse; like I said, it's fun to see how just a little more or less weight changes the experience. It's a marketting gimmick. Find a weight that is comfortable for you and practise with it. Unless you're playing FPS games competitively, more practise is going to improve your aim far more than spending ages trying decide if you want +30g or +15g would. I've had my G500 for almost a week, and I'm really glad I picked a weightable mouse this time. Right now there's 10.7g up against the thumb, balancing the mouse between it and the last joint of the ring finger. Now when I lift the mouse it swings easily around my thumb, and I can reposition the mouse without percussing it. I'd guess it's about medium weighted now; I can only fit 6 weights. The (square) weight tray fits into the mouse facing any of eight possible directions, counting upside down as well, which makes it more than fidgety enough for the general mouse-wielding populace. Wait no, that's not entirely correct... I chose the G500 because it was the cheapest mouse there. Still glad I got a weightable one. It's like all my life I've been driving cars without adjustable seats or mirrors. We should support these types of streamlining of hardware interfaces and other such things, for it only bring us closer to our cyborg future. I for one can't wait. It's a matter of personal preference. The weights are provided to allow users to suit the mouse to their taste. I recently purchased a Roccat Kone XTD, and coming from a heavy wireless mouse, I felt that the mouse was too light for me without weights. Adding 10 g of weights made it feel more natural for me, without the sort of heft that my Microsoft Wireless Mouse 5000 had. Different users will have different preferences. A heaver mouse makes it easier to make fine movements, while a lighter mouse makes it easier to make large movements. By adding weight you increase the force required to accelerate and decelerate the mouse according to F=MA, or Force = Mass x Acceleration, from Newton's Second Law. If the mouse has more mass, your hand has to work harder to move it. For the purposes of this article, we'll assume that half of any given mouse movement is acceleration and the other half is deceleration. So you're working harder to start the motion and stop the motion. Momentum takes place in between acceleration and deceleration. Momentum is stated as P=MV or Momentum = Mass x Velocity, again from Mr. Newton. What this says is that when something of a given mass is moving at some velocity, it's going to take an equal amount of mass and velocity in the opposite direction to stop it. A basic example is Car vs Minivan, head-on, both travelling at the same speed, in a test lab. The net reaction after the impact will be a slower speed in the direction the minivan was going for both vehicles because the minivan had a higher mass. (We'll ignore the fact that the vehicles deform in an impact for the purposes of this explanation.) What does this mean for the mouse? After it accelerates, it now has momentum and requires your hand to provide an opposite momentum to counter its movement. There are three parts of this system, the mouse your hand and the mouse pad or other such tracking surface. Mouse makers usually try to make the friction between the mouse and the pad as low as possible so it's only your hand interacting with the mouse. Practically we'll ignore the friction between the mouse and the pad, mathematically there is some resistance. So if you add all the weights you can increase the mouses mass by about 15% (in approximately 3% increments). For these next assumptions, we'll use all metric to avoid confusion. You make a quick 90º turn in your FPS - moving your mouse 2.5 cm (about 1 inch) in 0.1 seconds. An acceleration and deceleration of 5 m/s/s. For a fully loaded mouse, that's 0.695 N - empty it's 0.605 N. Can you hand take that? 55 N >> 0.7 N. But what does the difference between empty and fully loaded really feel like? The "real" answer is 18 grams. The practical answer is about the force it takes to turn a slightly-less-than-ideally fitting nut onto a correctly sized bolt - not very much. What about momentum? An average human hand weights about 0.58% of their total body, so for 140 lb person (about 63 kg), that's about 0.365 kg for a hand. This is 3.8 times more than our fully loaded mouse, or 3.3 times for the empty version. So when your hand decides to "collide" with your mouse, I'm pretty sure your hand is going to win. But what does this mean to me? (How do I use them correctly?) That's really up to the perception of each person. By changing the weight you're changing the "balance of power" between your hand and the mouse. I can suggest that you "bounce" your mouse back and forth between your thumb and pinky quickly with various weights and see if you a) notice a difference, b) if you do, tune it to what you like. People with a stronger "grip" or general hand/arm strength may find that a lighter mouse may move too much when performing quick movements. As to "How do I arrange my weights?" While technically, the placements of the weights in the mouse affects its center of mass, which affect how it moves when your grip interacts with it - practically it really doesn't matter. The individual weights are so small compared to the overall weight of the mouse, AND, you're moving the mouse as a whole, AND generally the whole mouse is moving in and with your hand, you'll never notice. Unless... (just for the few of you where it does matter), you move your mouse by using only two fingers, in which case, ideally, you want all of the mouses mass concentrated between the "squeeze points" of your fingers - otherwise you get unwanted rotation when you try and translate the mouse on the pad. Try drawing 50 circles as fast as you can in paint brush. if your circles are not perfect, a weighted mouse may help you swing the mouse less or more depending on your style and hand strength, and where you set the weights. I feel as if the more accurate I draw a circle (going very fast) the more accurate I am over all because I seem to have much more balance in my mousse "swings". It also helps drawing with the mouse. In order to perform better in the game, you need to have superior gaming hardware which has the technological advantage in comparison to regular mouse used with everyday computers. The most important aspects of the gaming mouse hardware are the laser technology, the programmable keys, weight control, ergonomic design for easy grip and changeable LED lights etc. The high-quality laser technology ensures the precision and accuracy in your game, and result in better control in the computer game. So when you use a gaming mouse, you can sure that it provides superior accuracy and control of your game. The underside of the mouse retains that triangle motif as well as the blue color. The PTFT mouse-feet, instead of being at the four ends of the mouse, surround the sensor housing in an odd way, and in large chunks. This is mostly to aid the sensor in its all-surface features. Around the sensor is the housing for the weights, which is secured in place by a magnetic cover. Open it and you'll see the odd pentagonal weight placement pattern. There's an ergonomic reason for this. The weights are cut in an arrow pattern, and you can place them in anywhere around that pentagon. Everyone's wrist is different, especially in the weight it exerts when using a mouse, so to negate lift on the left side, you can just anchor that side down with a weight to bring balance to the mouse, thus reducing strain. If anyone is facing problem regarding Alienware, they can take help from Alienware Support, I also get help from here. Is there a way to show an outline around the mouse cursor on mouse down or mouse up on OSX?